Australian Idol runner up Jessica Mauboy has won the Northern Territory Young Achiever Arts award sponsored by Charles Darwin University for the second time. Jessica, 17, who previously won the Arts award in 2004, was recognised for her achievements along with the cream of the Territory’s youth as a part of the presentation of the prestigious 2007 NT Young Achiever Awards on Saturday 14 April. Jessica overwhelmed the NT and the nation when she reached the finals in TV talent show Australian Idol. Jessica has worked tirelessly as a singer and continued her studies whilst pursuing her dream. Most recently she released a CD based on her Idol journey. The CDU Arts Award celebrates young Territorians’ brilliant artistic achievements and recognises the incredible imagination, initiative and flair required to produce such inspirational work. 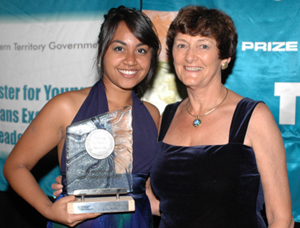 CDU is a proud supporter of the Awards which acknowledge, encourage and promote the positive achievements of young Territorians between 14 and 26 years of age.